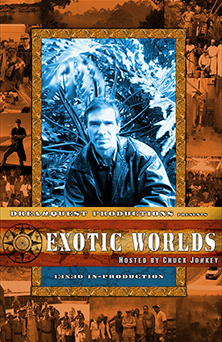 Chuck Jonkey, referred to as the Indiana Jones of the Music World by The Tolucan newspaper, has traveled around the world in search of adventure and music among the worlds most isolated tribal groups. His music credits include Rambo 4, In The Mix, Survivor, The Doors, J.F.K. and many more. His expeditions have taken him to the deep Amazon and rainforests of Thailand, Costa Rica, Guatemala, Brazil, Colombia, Indonesia, Peru and Mexico just to name a few. This television series shot in HD (High Definition) takes the viewer on an expedition quest like none other traversing through jungles, deserts, swamps and rain forests, to find remote villages and record some of the most exotic and unknown music to exist. What we return with is the most exciting part of the show!